Hey, West Michigan readers! I’d like to invite you to the David D. Hunting YMCA in Grand Rapids Tuesday night to make a birdhouse with the Grand Rapids Craft Club. We will be hosting a workshop led by Dan Boy, the master woodworker I featured in today’s Grand Rapids Press craft column. 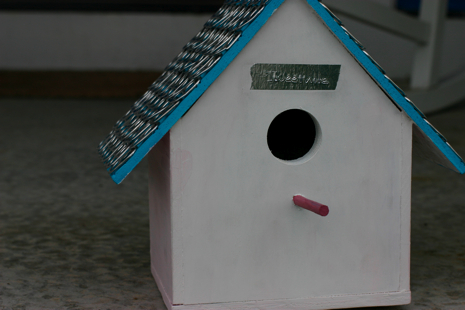 The workshop is from 6:30 to 8:30 p.m. and the birdhouse kits are $3. We will be assembling birdhouses and then decorating them in creative ways. I used pop can tabs to make shingles for mine and wrote “Tweetville” on foil tape stuck above the entrance. But these houses can be embellished in countless other ways. I still want to cover one with cancelled stamps and wood-burn text onto another. Crafter’s age 10 and up are welcome to attend this event, but minors must be accompanied by an adult. These birdhouses make great Father’s Day gift’s. This would also be a fun project for a mom or dad to make with their child. If you’d like to attend, e-mail me by 6 p.m. Monday. See you there! WHAM! BAM! The Loudest CRAFT CLUB Workshop EVER!